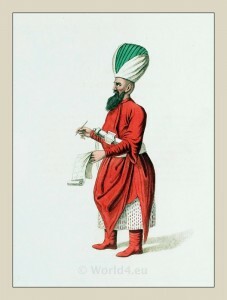 Home » Subaltern Officer of the Janissary. Ottoman Empire Costume. THE whole body of Janissaries is divided into one hundred and one companies, or Ortàs, in numerical order; and each of them has its different officers, who are equally attached to the army and the kitchen. The Tchorbadgi, or colonels of companies, signify givers of soup. The Achetchi-Bachi, are majors, and principal officers of the kitchen. Each company has one; and he, who is attached to the Janissary corps, is major-general. This plate represents an Inferior Officer of the corps, who is in the act of taking down the names of the men as they pass. This is the common mode of writing among the Turks, who seldom use a table.